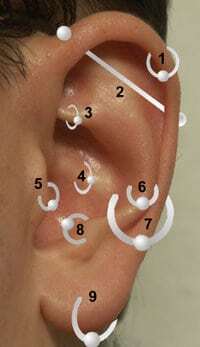 Many parts of the ear are commonly pierced, as indicated in the diagram to the left and detailed below. Septum: A piercing in the tissue dividing the nostrils. Usually, the piercing is located not in the cartilage, but in the tissue between the cartilage and the bottom of the nose, typically starting at a small gauge and then stretching to a larger gauge. Nostril: As it sounds, a piercing of either the right or left nostril and a much more common piercing for women. Multiple nostril piercings are not unusual with nose screws, nose bones, and captive bead rings being the most common form of jewelry. 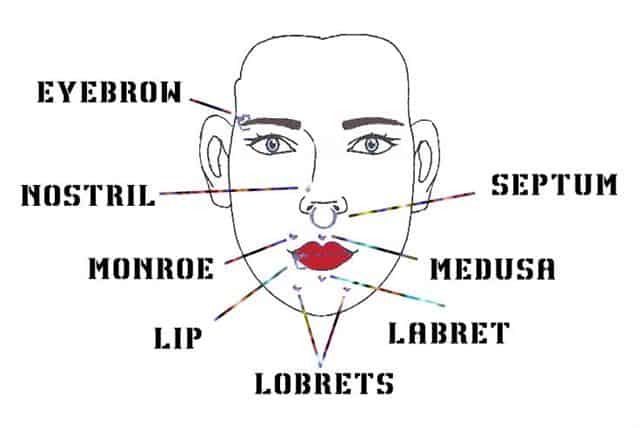 Labret: A labret is any piercing of the facial lip or labrum. The term usually refers to a centered piercing below the bottom lip and above the chin. A lowbret is a labret placed as absolutely low as possible inside the lip. Medusa: An upper lip piercing, the Medusa is similar to a labret. It is placed through the philtrum, directly under the septum of the nose. Monroe/Madonna: Upper lip piercings placed off-center to resemble beauty marks. A Monroe is to the left, a Madonna to the right. Lip: Any piercing which penetrates the lip or the area surrounding the lips. The lip and surrounding area can be pierced in a variety of ways – upper lip, lower lip, centered, or bilaterally. Lip piercings include angel bites, canine bites, cyber bites, dahlia bites, dolphin bites, fairy bites, shark bites, snake bites, spider bites, triangle bites and T-Rex bites. Eyebrow: A usually vertical facial piercing that is relatively common, placed anywhere along the eyebrow from directly above the eye to the edge of the eyebrow. Erl/Earl: A piercing through the skin on the bridge of the nose, usually directly between the eyes of the wearer. Tongue: Obviously, this piercing is a piercing of the tongue, usually directly through its center. Venom piercings consist of two smaller sized piercings on the left and right of the tongue close to the tip. Cow Udder: Nothing to do with piercings, just checking to see if everyone is paying attention.